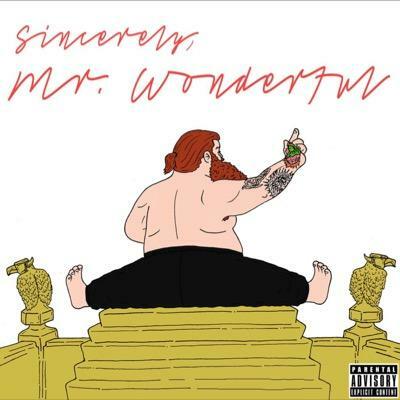 After much anticipation, and a long-drawn out saga leading up to the release of Action Bronson’s debut, we’ve now finally been blessed with Mr Wonderful. With the high critical acclaim that went with his Blue Chips mixtape, as well as a particularly memorable EP with Harry Fraud- Saaab Stories, there was a lot riding on Action Bronson’s first studio release. Featuring guest spots from Big Body Bes, Chance The Rapper and Party Supplies, the 13-track project was also home to guest production from the likes of Mark Ronson. The Alchemist and 88-Keys. For those of you like me who have been monitoring the status of Mr Wonderful with a beady eye, you’ve probably heard the most recent single featuring Chance The Rapper-Baby Blue. If you want a flavour as to how the rest of the album plays out, Baby Blue is a good representative. Featuring piano chords as the key productional quality, probes of brass providing the beef, and [sometimes] a lazily recited hook epitomising Bronson’s persona. What this does is gives the album a real ‘hip-hop’ feel to this, sometimes possessing an underground vibe to it, what with so much of the project relying on Bronson’s bars. This is both a gift and a curse, and it does two things for Action Bronson and his debut. Bronsolino’s consonant-tumbling delivery gives the air of effortlessness, and tracks like Actin’ Crazy peak out as some gems within an exciting debut. However, in a lot of occasions, such as with the same song aforementioned, such a crappy hook is chucked in for good measure, when it’s simply not needed. Then I start to consider wether it’s effortlessness, or actual laziness. Mr Wonderful was a massively hyped-up release, from one of hip-hop’s biggest up-and-comers. Action Bronson has crafted a solid album that is a back-to-basics rap album, with production handled by a fair few esteemed producers, the album has a real ‘rap’ feel to it. There’s no frills, not a lot of game-changing aspects, but Bronson’s rapping is as solid as ever, and that is something to write home about.